The same ascetic expression found in CH37 and CH44 easy chair is also evident in CH46 and its companion side chair CH47. 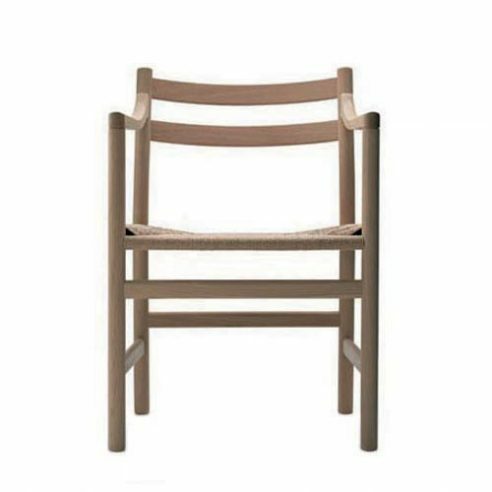 Unlike CH37, CH46 is sturdier in appearance yet it is clearly influenced by the Shaker chairs, and has the same characteristic armrests and rails in the back. The dining room chair CH47 is a companion to model CH46. These two chairs were the first in a long series of Shaker inspired chairs that Wegner designed for Carl Hansen & Son throughout the 1960s. The Shaker, a religious sect in the United States, comprising of northern European immigrants had since the beginning of the 19th century have lived in small communities.